When you’re on a call, the screen shows several call options. End a call. Tap or press the Sleep/Wake button. Use another app while on a call. Press the Home button, then open the app. To return to the call, tap the green bar at the top of the screen. Ignore the call and send it to voicemail: Tap Ignore. Put the first call on hold and answer the new one: Tap Hold + Accept. 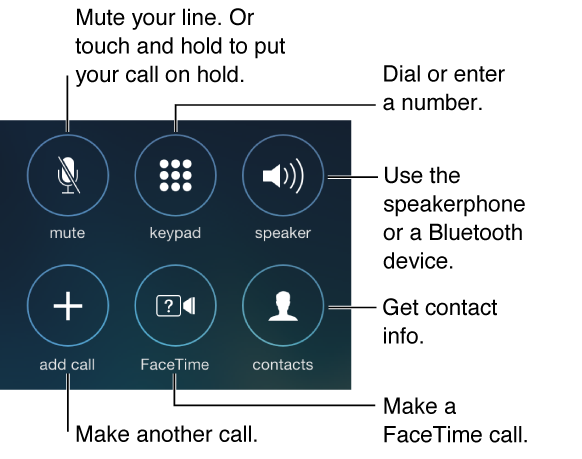 End the first call and answer the new one: When using a GSM network, tap End + Accept. With a CDMA network, tap End and when the second call rings back, tap Accept, or drag the slider if the phone is locked. With a call on hold, tap Swap to switch between calls or tap Merge Calls to talk with both parties at once. See Conference calls. Note: With CDMA, you can’t switch between calls if the second call was outgoing, but you can merge the calls. You can’t merge calls if the second call was incoming. If you end the second call or the merged call, both calls are terminated.